Convened by State Assemblymember and Correction Committee Chair David Weprin, in partnership with the Legal Action Center and the Prisoner Reentry Institute of John Jay College, more than 30 experts and advocates participated in a roundtable at John Jay College of Criminal Justice to share information and to suggest strategies to expand alternative-to-incarceration (ATI) and reentry services within New York State. Since the 1980s, the State Legislature has provided crucial funding to support many of these programs, which have helped reduce crime, shrink the prison population, provide people with ”second chances,” and save taxpayers millions of dollars. Roundtable participants shared recommendations on alternatives to detention and incarceration, diversion, and reentry programs, and on services that focus on employment, housing, mental health, drug treatment, and women and special populations. 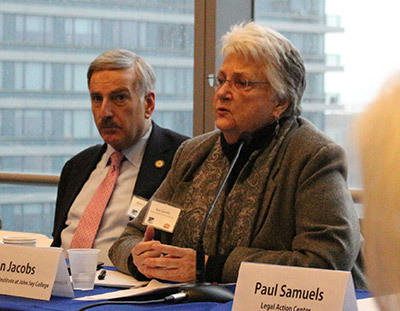 Ann Jacobs, Director of the Prisoner Reentry Institute (PRI) at John Jay College, noted the importance of access to higher education for people after their justice involvement. She announced the pending release of a PRI report which maps the higher education programs currently operating inside New York State prisons. The report recommends an expansion of college in prison and increased use of educational release in the last two years of incarceration.